Rabies – Prevent rabies that can be transferred to your canine or feline friends from skunks, raccoons and fox by bite. Rabies is zoonotic which means it can be transferred to humans. If a human or your pet gets rabies it is fatal. Distemper/Lepto – Distemper are viruses that can be transferred from dogs and raccoons. You can even spread it by your clothing to your dog even if your dog isn’t around other dogs or raccoons. Lepto is transferred through rat and raccoon urine which can be in any kind of water including puddles. Lepto is also zoonotic which can be transferred to humans. Lyme – Lyme disease is transferred through ticks. The Lyme vaccination only helps protect against Lyme disease but not other tick borne disease. Influenza – Another flu that can be found at doggie day cares, boarding, groomers, and dog parks. Bordatella – or kennel cough is also found at doggie day cares, boarding, groomers, and dog parks. FVR – Distemper are viruses that can be transferred from cats and raccoons. You can even spread it by your clothing to your cat even if your cat isn’t around other cats or raccoons. Leukemia – is cancer in cats spread though bites and saliva. 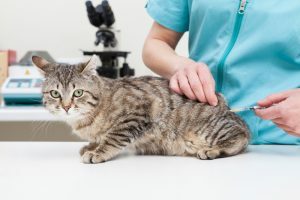 Your cat should have this vaccine done if it is going outside unintended or exposed to other cats going indoor/ outdoor.